Besuchen Sie die Stadt Malakka, die Hauptstadt des gleichnamigen malaysischen Staates, auf diesem Tagesausflug von Kuala Lumpur aus. Etwa 145 km südlich von KL ist Malacca ein UNESCO-Weltkulturerbe, das für Sehenswürdigkeiten wie das Fort A Famosa, die St. Paul's Church aus dem 16. Jahrhundert, die Christ Church und Stadthuys am Roten Platz bekannt ist. Genießen Sie eine Sightseeing-Tour mit einem Führer und erkunden Sie die Jonker Street, wo Sie zum Mittagessen einkehren können. We were surprised to be picked up by a car and driver when we had expected a bus. He was on time and could speak very good English. During the drive, Neson explained the history of Malaysia, the changes that have taken place and gave an insight into everyday life. He was well informed and entertaining. On arrival at Malacca, we had two hours to explore on our own. Our guide suggested doing a boat trip down the river which we were very pleased we chose to do and would reccomend that to others as it was interesting and gave a different perspective to the town. After that we spent some time in Jonker Street before going for lunch. An enjoyable day out from the city. As long as you are fully aware of timings - this is a good trip. It's about 2 - 2.5 hours by coach from KL to Malacca - and it is a case of 20 minutes here, 20 minutes there. All in all, around 1.5 - 2 hours total spent at the tourist sites - an hour having lunch normal chinese - nothing malaccan and then the journey back. 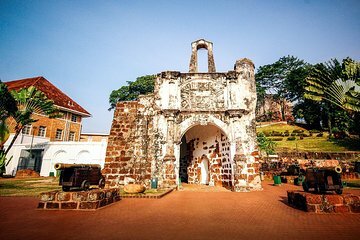 You do get to see all the main bits of Malacca - time enough for photos and to say you have been there - but certainly no time to leisurely explore. was good but more time was wasted on things which should not have even been visited. Things which should be seen like Museums were not even covered. Tour was spoiled by rude behavior of Guide and not eatable food.